The largest percentage of those who are illiterate in Panama is concentrated in the comarca of Ngabe-Bugle and the provinces of Veraguas and Panama. Sept 8 (teleSUR) Cuba’s internationally recognized literacy program, Yo si Puedo, has helped Panama reduce its illiteracy rate by half over the past 11 years. In 2010, Panama’s comptroller demographic census revealed that a total of 148,747 people were illiterate. However, 2018 statistics compiled by the Ministry of Social Development, or Mides, show that the total number of illiterate persons has been reduced to 74,080. 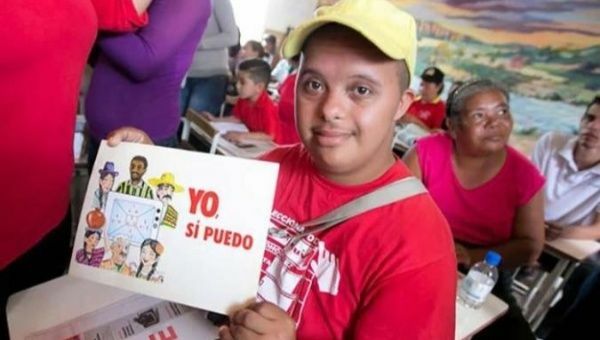 In its quest to reduce the illiteracy rate, the Panamanian government adopted Yo Si Puedo, which uses numbers and letters to teach adults how to read and write. One-hundred and fifty Panamanian volunteers were recruited to implement the program said Freddy Alvarez, head of the Cuban collaborator group. The program lasts for a period of three months and is divided into equal parts: learn how to read and write; transitory period improving reading and writing; and post-literacy or schooling, according to Prensa Latina. Alvarez emphasized that audiovisual tools and innovative techniques are used to support classes. Each classroom is equipped with a board, television and DVD player and students are provided with pencils and notebooks. Clara Mendes, the director of Mides, said the largest percentage of those who are illiterate in Panama are concentrated in the indigenous comarca of Ngabe-Bugle and the provinces of Veraguas and Panama. More than 10 million people in around 30 countries have now learned to read and write through the Cuban literacy program, which currently operates in around 30 countries, from Venezuela, Nigeria, Spain and Australia. Many of the countries that have used the program have seen their illiteracy rates fall dramatically. Si Yo Puedo is adapted specifically to the geographic areas where it is implemented. Local vocabulary is also used.